Hillfield Strathallan College is a day school and Visa students typically reside with local families, chosen through a third party agency. Admission to HSC is not dependent on one single factor. A committee considers information shared on the application – including academic records, test/assessment results and interview/school visit, as well as a student’s character, talent and leadership qualities. Should you have any questions regarding the online application or our admissions process, please contact the HSC Admissions Office at 905-389-1367, ext. 106 or Sheriann Heath-Johnston at heathsh@hsc.on.ca. Whenever possible, candidates are encouraged to visit the College for an initial tour. 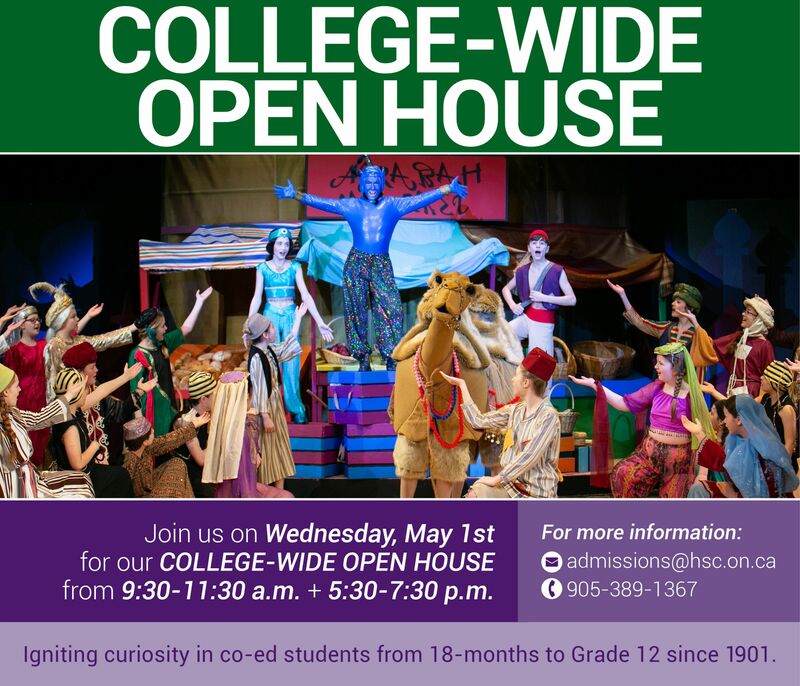 There are multiple HSC Open house dates scheduled throughout the year. The application process begins with the creation of an online account, which will be your portal to completing your online application. The final page of the application requires applicants to attach the following documents. You may also submit them via e-mail (admissions@hsc.on.ca), fax (905-389-6366) or delivered/mailed to the Admissions Office at 299 Fennell Avenue West, Hamilton, Ontario, L9C 1G3. - A copy of the applicant’s birth certificate, passport and a parent’s work permit, if available. - Both official and English translated copies of school reports for the previous two years. When English is not the applicant’s first language, an English proficiency assessment may be requested at the discretion of the Admissions Office. Once you have completed the application you will be directed to pay, via credit card, a non-refundable $250.00 international application fee. Once payment is made, you will have the opportunity to review the document. You must click the Submit button at the bottom of the Review page in order to successfully complete your application. Following receipt of your application, the Admissions Office will contact you to arrange a visit day if possible, or an online interview via Skype, along with confirming required documentation. Once the application process is complete, applicants will receive a timely decision and accepted students will be issued an enrolment package. To secure placement, all enrolment forms must be completed and returned within 14 business days including full payment of the tuition fees as well as the non-refundable $4,500.00 international registration fee. Please see our International Enrolment Booklet for complete details. Upon receipt of full fees and completed enrolment forms, the College will issue a letter for immigration purposes. Whenever possible, candidates are encouraged to visit the College for an initial tour.There are multiple open house dates scheduled throughout the year. The application will begin with the creation of an online account, which will be your portal to completing the online application. The final page of the application will require you to submit the following documents via email (admissions@hsc.on.ca), fax (905-389-6366) or deliver/mail to the Admissions Office at 299 Fennell Ave. West, Hamilton, ON L9C 1G3. International study permit students must submit English Proficiency Test Results with applications. Whenever possible, please select HSC as the recipient of all test scores. For students taking TOEFL, the HSC TOEFL school code is: 5087. Click here to view a chart of our minimum test score requirements. Further subject-specific assessments may be requested at the discretion of the Admissions Office. Following receipt of the application, the Admissions Office will contact the applicant to arrange a visit day if possible, or an online Skype interview along with confirming required documentation. Applicants will receive a timely decision and accepted students will be issued an enrolment package. To secure placement, all enrolment forms must be completed and returned within 14 business days, along with full payment of the tuition fees (Plan I) and the non-refundable $4,500.00 registration fee, both detailed in the Enrolment Booklet.